By its sixth season, Star Trek: The Next Generation had figured out how to maximize its cast and characters. 1175 min. Paramount Television. Directors: Les Landau, Cliff Bole, Winrich Kolbe, Alexander Singer, Robert Wiemer, Robert Scheerer, Adam Nimoy, Patrick Stewart, Jonathan Frakes, Gabrielle Beaumont, Dan Curry, James L. Conway, Levar Burton. Cast: Patrick Stewart, Jonathan Frakes, Brent Spiner, Michael Dorn, Levar Burton, Levar Burton, Gates McFadden, Marina Sirtis, Whoopi Goldberg, Michelle Forbes, Brian Bonsall, John de Lancie, Dwight Schultz, Daniel Davis, James Doohan, Ronny Cox, Alexander Siddig, James Cromwell, Rosalind Chao, Olivia D'Abo, David Warner, Norman Lloyd. By its sixth season, Star Trek: The Next Generation had figured out how to maximize its cast and characters. The writers knew unequivocally what Patrick Stewart could do, and how foolhardy it would be not to take advantage of it. At the same time, they found better ways to offer time to the ensemble of regulars (including as directors: Patrick Stewart, Jonathan Frakes and LeVar Burton all helmed Season Six episodes). Season Six also has the good sense to include not one but two episodes featuring the omnipotent "Q" (the incomparable John de Lancie), among other welcome return visits. And, following the well-received appearances of DeForest Kelley and Leonard Nimoy, the producers scheduled a visit from original Star Trek cast member James Doohan. That episode, "Relics," holds up as more than a nostalgic gimmick. Writer Ronald D. Moore gives the outing a strong science-fiction element (an encounter with a hypothethical Dyson sphere) and an even stronger theme: the role of the elderly in mainstream society. When the former engineer of the Enterprise registered as NCC-1701 emerges from a transporter buffer, Captain Montgomery Scott (Doohan) goes through an entirely credible emotional roller coaster: thrilled to be alive and with the opportunity to explore the Engineering Room of the future, devastated at his uselessness—as perceived by the new Enterprise's chief engineer (Burton's Geordi) and prematurely accepted by Scotty, and finally heartened to discover he still has much to offer and to explore. The dramatization of the consequences of retirement and ways to redefine defines an episode that also does have a powerful nostalgic kick, largely due to a perfect recreation of the original Enterprise bridge (where Scotty and Stewart's Captain Jean-Luc Picard share a terrific scene). Season Six includes two complete two parters: "Chain of Command" (click for complete review) and "Birthright." The Klingon epic "Birthright" introduces Deep Space Nine, the space station that had recently been granted its own series (Siddig El Fadil appears as Dr. Bashir). Probably the season's most memorable outing is "Tapestry," the Q story that uses elements of Stewart's beloved "A Christmas Carol" (the actor performed it for years in a one-man show) and "It's a Wonderful Life" to explore the importance of a seminal event in Picard's life: the loss of his biological heart in a bar brawl he ascribes to his "wild youth." In another tour de force performance, Stewart delineates a journey of self-discovery for Picard, with a range of resonant emotions along the way. At season's end, the show kicked off yet another two-parter in "Descent," a story featuring Data, Lore and the Borg. Only one year of first-run Star Trek: The Next Generation episodes remained. By now, there's really nothing new to say about how Star Trek: The Next Generation looks and sounds in hi-def Blu-ray. This presentation, in the original aspect ratio of 1:33:1, is revelatory for longtime fans of the show, and up to modern HD standards for newcomers to the material. Color is bold, rich, and true; detail and texture sharp, and black level and contrast perfectly calibrated. Standard-def special effects have been tastefully recreated in HD to bring the show into the 21st century. The DTS-HD Master Audio 7.1 mixes open up the soundfield for convincing immersion and an entirely crisp and full overall audio experience. The set includes a wealth of bonus material, some culled from the previous DVD release and some newly produced in HD. Each episode comes with the option of viewing its archived "Episodic Promo" (:30, SD), and Disc One includes audio commentary with writer Ronald D. Moore and Star Trek experts Mike & Denise Okuda for "Relics," "Deleted Scenes" from "Time's Arrow, Part II" (2:37, HD) and "Relics" (4:09, HD), and "Archival Mission Log: Mission Overview Year Six" (17:55, SD), which covers the likes of "Time's Arrow, Part II," "Relics," "Chain of Command," "Descent, Part 1," and "Birthright, Part 1," as well as Stephen Hawking's guest spot and the introduction of Deep Space Nine. Disc Two serves up a "Deleted Scene" (2:08, HD) from "Q Who"; "Bold New Directions" (17:57, SD), which lets the cast members highlight their favorite episodes of the season, including "A Fistful of Datas" and "Second Chances"; and "Departmental Briefing Year Six: Production" (15:33, SD), which hones in on the Dyson Sphere, recreating the original Enterprise bridge for "Relics," alien makeup in "Birthright, Part 1," Data-themed effects, and elements of the episodes "Tapestry," "Rascals," "Chain of Command," and "Frame of Mind"; and "Departmental Briefing Year Six: Dan Curry" (19:56, SD) profiles the visual effects producer, including a tour of his home and memorabilia. Disc Three houses "Deleted Scenes" from "Ship in a Bottle" (2:35, HD) and "Face of the Enemy" (1:10, HD) and "Special Crew Profile: Lt. Cmdr. Data" (19:00, SD), profiling Spiner and his character. Disc Four includes audio commentary from writer Ronald D. Moore and Star Trek Experts Mike and Denise Okuda for "Tapestry," "Deleted Scenes" from "Tapestry" (6:37, HD) and "Birthright, Part II" (13:41), and "Archival Mission Log: Select Historical Data" (18:14, SD), collating topics like Robert O'Reilly's embodiment of Gowron, composer Jay Chattaway's contributions, LeVar Burton's Visor acting, Brent Spiner's stand-in Guy Vardaman, visual effects work, sound effects, editing, and more. Disc Five offers audio commentary by director James L. Conway and director of photography Jonathan West for "Frame of Mind," "Deleted Scenes" from "The Chase" (1:46, HD) and "Rightful Heir" (12:11, HD), and "Archival Mission Logs: Inside Starfleet Archives: Sets and Props" (13:10, SD), a nifty tour guided by set decorator James Mees. 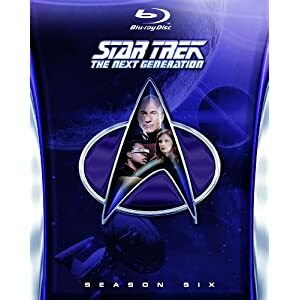 Disc Six holds the lion's share of extras, beginning with the new "Beyond the Five Year Mission -- The Evolution of Star Trek: The Next Generation." "Part One: The Lithosphere" (24:52, HD), which largely takes the perspective of the writers and production team. Participants include writer-producers Naren Shankar, Moore, and Michael Piller (vintage 1993 interview); executive story editor René Echevarria; executive producer Rick Berman; supervising producer Frank Abatemarco; production associate Dave Rossi; writer Morgan Gendel and Colm Meaney (vintage 1993). The writers discuss their hits and misses while affirming that the show had hit its stride (for what might be its best overall season); the launch of Star Trek: Deep Space Nine also gets covered. "Part Two: The Biosphere" (29:32, HD) continues the story by opening a grab bag of Season Six topics, including "Birthright, Part II," "Relics," and Stephen Hawking. Additional participants include production designer Richard D. James, co-producer Wendy Neuss, Curry, West and, in 1993 archival interviews, Stephen Hawking and Brent Spiner. "Part Three: The Noosphere" (29:59, HD) gives the cast perspective from Patrick Stewart, Jonathan Frakes, Spiner, Marina Sirtis, Michael Dorn, Gates McFadden, LeVar Burton, Whoopi Goldberg, and John de Lancie, who discuss a wide variety of topics, including Season Six highlights, the origins of Goldberg's involvement in the show, cast members as directors, Hawking, and working with Spot. As always, this is a fantastic HD debut for a Star Trek: The Next Generation season, one that no self-respecting Trekker will want to live without. All site content © 2000-2019 Peter Canavese. Page generated at 04/24/2019 07:49:20AM.